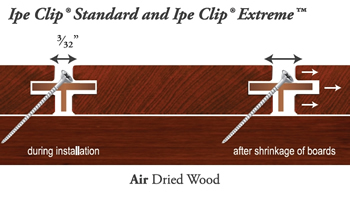 If you are buying wood that needs to be air-dried and are wondering what hidden deck fastener to buy, this guide is for you. If you don’t know why air-drying wood is even worth mentioning, let’s take a look at the purpose of air-drying wood. Boost dimensional stability. Wood contracts (shrinks) across the grain when it dries. 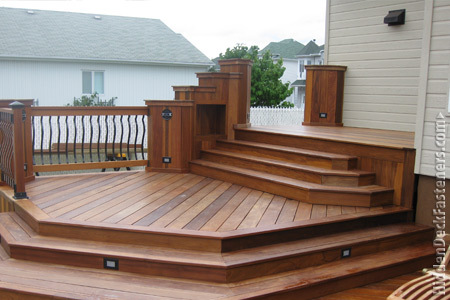 If you cut your decking before it has acclimated to the surrounding air-moisture content, it will contract as it dries and will end up being smaller, thereby throwing off your deck plans altogether. Reduce or eliminate the chances of decay & sap staining. When you let your decking dry below 20% moisture content, you increase the chance it will end up decaying and getting sap stains. Give your decking a diet. Seriously, by allowing your deck to air-dry, it will be a lot lighter. The process of seasoning decking means that you can reduce the weight over 30% just by allowing excess moisture to be removed. Make your decking stronger. Air dried wood is stiffer, harder and stronger. In fact, most species of hardwood decking are around 50% stronger so long as the wood has a moisture content of roughly 15%. OK. So, now you know about air-dried decking. But the question now is: What deck fasteners go with Aid-dried wood decking? Learn more about the DeckWise® Extreme™ ExtremeKD™ or the Extreme4™ and why it is the best deck fastener for air-dried wood decking.